Phyl's Blog: Have I mentioned how much I hate my car? For over a year it's been acting up in small ways. It currently needs new wheels, new tyres, its exhaust has been on its last legs for ages and for over a year the turbo was faulty so it kept worryingly losing power. For no reason when driving down the motorway at max speed, it'd suddenly drop to half speed and cars would come up my backside so quickly it would frighten me half to death. I thought it had been fixed two months ago when a garage finally managed to silence the turbo light by fixing some pipe going into the turbo unit, only to find a fortnight later on our way to a meeting with the kids' teacher that the electronics went completely. Then instead of it having a top speed of about 40mph (70kmph), it was completely dead. 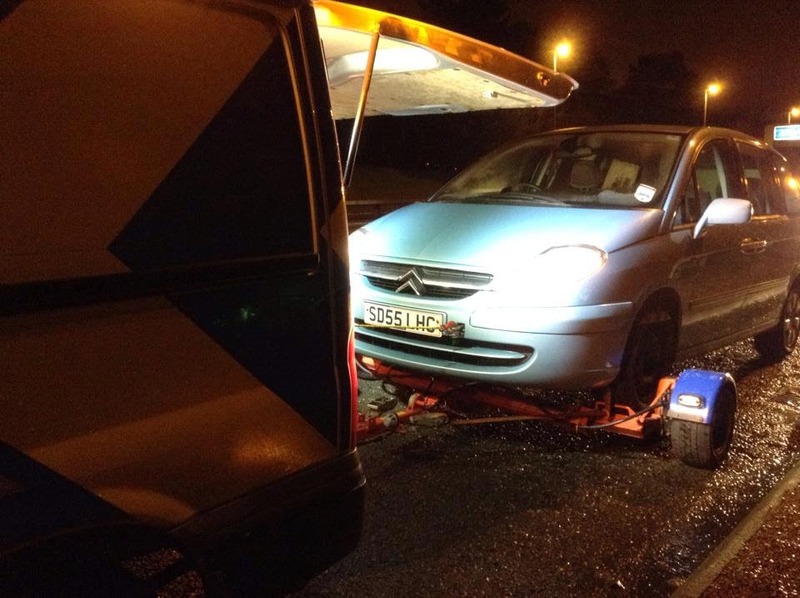 It spent a week with an expensive real Citroën dealer being re-fixed. So it behaved from mid-November till now - a whole seven weeks this time. I was almost starting to relax and feel I could go further than Asda. So we went to Silverburn which is fully five minutes on the motorway. On our way home I was driving it at just above 60mph (approx 100kmph) when it died completely with less than 10 seconds warning. It felt as if something popped under the car, there was a whoosh of air and it lost all power on a steep hill. Fortunately, I was not in the outside lane where the fast traffic would have run into me before I could get over to the side. Fortunately, the traffic was light so no one ran straight into the back of me where Amaia and Charlotte were sitting - that would not have made for the best birthday eve for little Amaia. Fortunately, for the 20 minutes all six of us had to stand on the grass verge at the side of the motorway the snow stopped, the gale-force wind abated and the rain wasn't torrential. Unfortunately, given we'd been at Silverburn (which is always way too hot) none of us had on warm enough clothes (though lucky Charlotte had bought a jacket in the sales today, so could take it out!) And fortunately there are still some decent people in the world. A man alone in a car stopped and offered to drive four of us home (he only had a five seater car), so only Charlotte and I remained the whole hour by the side of the cold, dark motorway in the cold and wet. It has become clear that even though we can't replace the blue car, it has to go. I'm not 100% sure how a family of seven is going to get around in one five seater car but enough is enough. It has to go. If you do not have any confidence left in a car, then it is time to say goodbye it. We do spend a significant amount of time in our cars, often conveying our loved ones from A to B. Its essential that we have every confidence in its performance.